A Labour-run council's deputy leader has said a party decision to drop her as a candidate in upcoming elections was a "hard-left stitch-up". 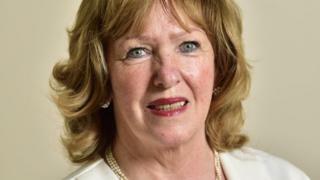 Wirral Council's Bernie Mooney said she was selected by Labour's Liscard branch in October to to run in May. However, the Local Campaign Forum (LCF) found a "number of procedures" had been breached in her selection and have decided to deselect her as a candidate. Declining to comment, the LCF said it was an "internal party procedure". Ms Mooney, who is also cabinet member for children and families, told the Local Democracy Reporting Service she was "bitterly disappointed" about not being given the chance "to serve the local community I have lived in for the past 40 years". "This was a democratic process, but one where the result didn't fit with the hard left agenda," she added. "Last night, their stitch-up paid off and I was deselected - not because I was a bad councillor, not because I didn't do my job and serve my constituents, but because I stood up and refused to be bullied. "This was a politically motivated decision, made because my views didn't fit with their narrow ideology." The council's leader Phil Davies, who announced he would step down in October citing "hard-line extremists", said it was "yet another example of a good, hard-working councillor being forced out of serving their community". "Already, councillors like Chris Meaden, Mike Sullivan and Moira McLaughlin, along with Frank Field MP for Birkenhead, have said they have had enough of this behaviour and have resigned from the Labour Party. "Now we have lost Bernie Mooney... she deserved better."